Used to state general truths, facts, or habits. Used to predict future probabilities. The speaker believes the event is likely and a real possibility. Used for unlikely or impossible events in the future: If I met an alien, I would ask many questions. Used for situations that are not true now (Counterfactual): If I weren’t here, I would be at home sleeping. Used for Past Counterfactuals. If WWII had not happened, … . Often used to express regret or mistakes: If you had told me to bring an umbrella, I would have brought one. IF clause uses 3rd conditional; result clause uses the 2nd If I hadn’t eaten it, my stomach wouldn’t be upset. 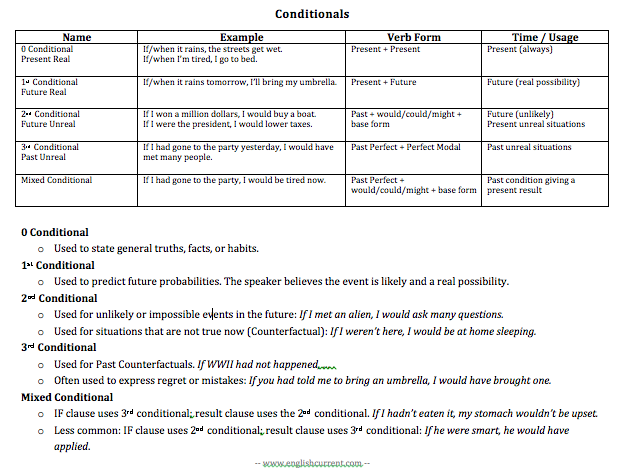 Less common: IF clause uses 2nd conditional; result clause uses 3rd conditional: If he were smart, he would have applied. I wish SUBJUNCTIVE STRUCTURE were there as well.